1. You may apply for one MSc programme only. Incomplete applications and applications submitted by mail or email will not be processed. 2. All applicants are required to pay a € 120 application fee. This is refunded only to students who start their MSc studies in Delft. You will be informed about the payment method in your online application. This includes a new application in Studielink. The English language certificate may be uploaded by 1 July (23:59 CEST), provided that all other required application documents are uploaded before the 1 April deadline. 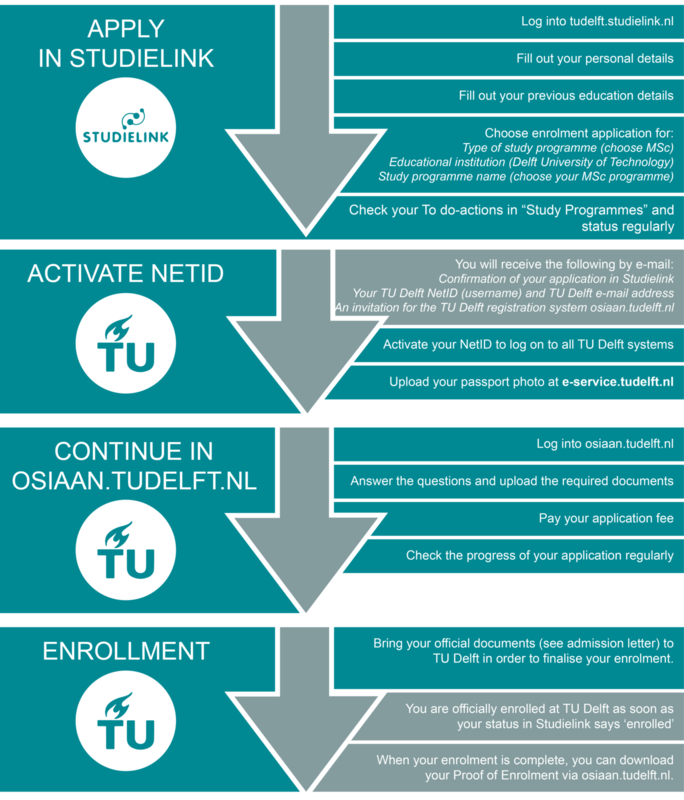 All required documents must be uploaded to osiaan.tudelft.nl and your complete application submitted by the corresponding deadline. Applicants applying for the MSc programme Aerospace Engineering and MSc programme Architecture Urbanism and Building Sciences will receive an admission decision at the end of February.